Sri Lanka is widely known for its culture, food, and history. Being a tropical island, the country also has a diverse range of beautiful natural landscapes. Tea estates nestled in picturesque hills, rainforests, and conservation national parks filled with exotic wildlife occupy a vast portion of the country. In this 4-day tour, we take you on a biking adventure through the natural and wild side of Sri Lanka. Known as the land of tea plantations, you will ride on undulating roads, close to deep-green tea estates as far as the eye can see. The cycling starts in Ginigathena to Dickoya and then onwards to Belihuloya. The trail takes you through some of the most picturesque hillside towns and richest biodiversities in the country. We ride on to Samanalwewa Dam where we switch our bikes for canoes and then back to bikes as we continue the journey to Udawalawe, where we will go on a wild safari. This bike tour takes you through a variety of landscapes and challenging tracks. It is sure to be a marvelous experience for nature lovers and cycling enthusiasts. Sri Lanka is also known for its rich culture, historic tradition religion. To discover such value, we have another 5-day tour that can fulfill your interest. Please check out and join North Sri Lanka by Road Bike and let the country tell you its story. Meet at the Goldi Sands Hotel in Negombo at 8:45 am. Transfer to Ginigathhena where we start our ride for the day. The ride is just about 20 km, weaving through scenic hilly routes with twists and turns towards our destination in Dickoya. The ride today takes us through lush-green tea estates, forest areas, and dirt tracks. It's a challenging ride as there will be steep climbs but you will also be rewarded with an exhilarating descent to Belihuloya. The town is ideal for nature lovers and also offers various adventure activities. Well-rested and full of energy, we take a short bike ride to Samanalewewa dam for some easy morning canoeing. We continue back on our bikes and ride on to the finish point in Weligepola where we transfer to our overnight hotel in Udawalawe. Rise up early morning today as we transfer to Udawalawe National Park, a conservation sanctuary for wild animals. We will have a picnic breakfast here. Then we continue on our bikes, passing through nature trails and local villages on the way to Middeniya where the cycling trip ends. Finally, we transfer you to the airport for your onward journey. Day 1 - Negombo - Dickoya Ride 21km. +501m / -242m. Our bicycle journey will be on quiet back roads, tea estate tracks, dirt trails and gravel paths. We cover 174 kilometers in 4 cycling days on mostly undulating terrain with steep hills and sharp turns. It will be an exciting ride with many nature and wildlife attractions to delve into, allowing you to truly enjoy this side of Sri Lanka. Featuring some of the finest terrain and scenery that Sri Lanka has to offer, you are sure to get the very best of a nature adventure from your cycling efforts. Suitability: This ride is suitable for those who have some cycling experience. You should be confident of your physical condition and bike handling skills. Some climbs are challenging and there will be quite a few back roads and dirt tracks. The days will be hot and humid, so keep hydrated at all times. This is a true journey through nature with some wildlife thrown in along the way, so watch out at all times. Biking Conditions: The beginning of this ride is relatively flat, but there will be hills to ride through. The road surfaces are mixed: vehicle main roads, gravel paths, dirt trails, green tea estate tracks with some steep uphills and downhills and through the forest. A moderate physical condition is required for this tour. A support jeep is always available to help. We meet at the Goldi Sands Hotel in Negombo at 8:45 am. By 9:00 am, we will transfer to the starting point of our cycling journey at the small town of Ginigathhena. From here we will ride to Dickoya, a tranquil town in the heart of tea country. The ride is just over 20 km with scenic views of lakes and lush green rolling hills. It will be slightly challenging as we steadily climb undulating roads with lots of twists and turns. We will keep on the back roads so keep an eye and camera ready to take shots of local life, animals, and scenery. After a hearty breakfast, we start the ride from Dickoya to Belihuloya. We pass through Campion tea estate via Bogawanthalawa (also known as the Golden Valley). We will ride up steep undulating hills through a mix of lush-green tea estates, forest areas, dirt tracks and main roads with pristine rainforests surrounding us. The first 40 km is a mostly steep climb up hills but then the rest of our journey is rewarded by an exciting downhill ride to Belihuloya, a hillside town. It is an ideal destination for nature lovers as it is regarded as one of the richest bio-diversity places in Sri Lanka. You can also find various adventure activities here amongst rivers, forests, lakes, and waterfalls. We stay overnight in Belihuloya to recharge for the next day. After breakfast, get ready for another exciting day. Today we will change the pace a little as we ride up a few steep hills for a few kilometers before descending down to Samanalewewa dam. Here we will switch our bikes for canoes, giving our legs a rest. Embraced by the breathtaking forests and green rolling mountains, you can leisurely paddle around for a few hours. Once you are ready, we hop back on our bikes and continue the journey to Udawalawe. The cycling trails lead us to discover various landscapes, villages, and small towns. Your legs will also be challenged with varying terrains and rolling hills. There is an exciting descent with a couple of switchbacks thrown in along the way. The road flattens out for a few km before a steady climb to Weligepola. After riding for a total of 43 km, we reach Weligepola where our cycling ends. With our bikes loaded up, we transfer to Udawalawe by vehicle. It's about an hour drive to our overnight hotel. This morning we wake up quite early as we leave the hotel at 6.00 am to visit the Udawalawe National Park by vehicle. Breakfast is prepared for you to be eaten at the park in a picnic style. The Udawalawe National Park is one of the topmost touristic attraction in Sri Lanka. Here you will find majestic animals such as the elephant, deer, buffalos, and if you are extremely lucky, you might catch a glimpse of the elusive leopard. After the safari, we will set off on our bikes from Udawalawe dam. 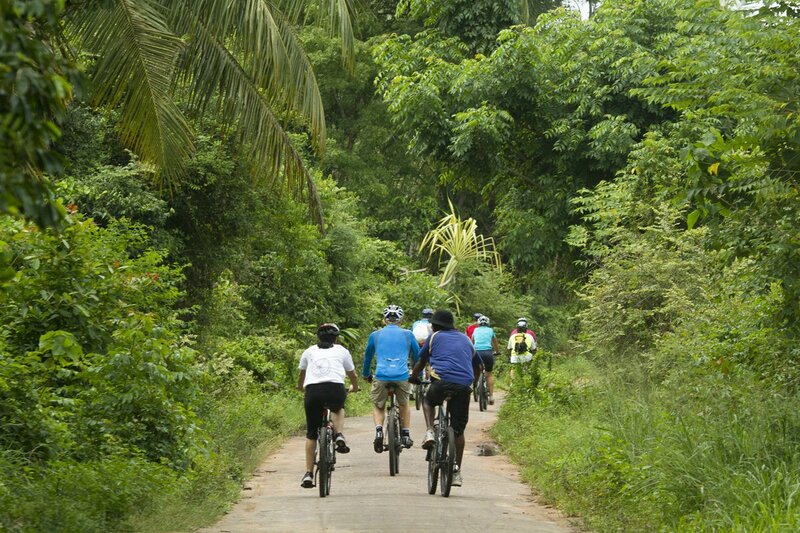 The riding trail will take you on the back roads through beautiful paddy fields and small villages. The cycling journey will be about 50 km. At the end of our cycling, we clean up at a guesthouse in Middeniya before having a well-deserved lunch at a local restaurant. Our adventurous trip ends here with bitter-sweet goodbyes as we transfer you to the airport or your hotel in Colombo. A mountain bike is included in this tour. They are well-known makes of mountain bikes with lightweight alloy frames, 24- to 27-speed gearing, disc/v-brakes and Shimano components and front suspension. We also have E-Bikes available for hire. They are of SCOTT brand and come in 2 models with alloy frames, 9-11 speed and Shimano disc brakes and components.